First of all, let me apologise for the quality of my photographs in this post-Ali (littlest cat) was being particularly awkward, wanting to be in on everything so the flashes of ginger are him! I have quite a few empties this month so let's get cracking! I picked this up in London and used it to clean my make-up brushes. This peppermint version wasn't as nice as the Citrus Orange version I reviewed here. This one seemed to leave almost a sticky residue on my brushes even though it is effective at removing all the make-up. But I often found that I was having to do a second wash with baby shampoo to get the residue off. What have I replaced it with? Johnsons baby shampoo, you just cant beat it for cleaning brushes! I used this as my morning cleansing balm, applying it to dry skin whilst the shower heated up and then removing with a wet flannel. This has a very balm like texture, quite sticky and probably too heavy for morning use if I am honest. Key ingredients are Argon Oil, Rice Silk, Assai Fruit and Rosemary Leaf. It does not contain any Shea butter, cocoa butter or beeswax if you have sensitivities to those. I didn't love it as a morning cleanser but it would have fitted into my evening routine nicely. There is something quite luxurious about Elemis I find and I did like the packaging. EVERY empties post of mine has one of these in-I adore it! I'll be stockpiling this again when I fly home next week as I can't buy it in Dubai and am down to my last bottle. Would I repurchase? Yes indeedy! Pretty much a holy grail item for me, I love this for giving my hair body and find it the perfect pick up for my hair when my highlights appointment is a couple of weeks overdue! What have I replaced it with? More Batiste, the cherry is my absolute fave! I know a lot of people absolutely love Bioderma but unfortunately I don't. For make up removal I find that although effective, after a couple of days use my skin is dry and irritated. I ended up using this bottle to remove my eye make up but I don't find it all that effective especially with waterproof mascara and there are cheaper and better options out there such as my beloved Simple eye make up remover. As you can see this bottle has a broken lid so I couldn't travel with it and it took me almost 9 months to use up this bottle. I started using this as soon as my Emma Hardie ran out and at first I really missed the softness and ease of application of the EH because this is a more waxy, honey like cleansing balm. I reviewed this balm here in my updated skincare routine post and as I mentioned there, my biggest bugbear is that it didn't remove all my make up effectively and a second cleanse was essential. The Emma Hardie definitely removed every scrap of make up. This is also really stingy round the eyes and I would definitely recommend using an eye make up remover first. Considering they are the same (ish) price I would go for the Emma Hardie every time over this one. What have I replaced it with? I have gone back to the Rodial Glamtox cleansing balm. I had initially tried a cleansing oil but it broke me out so I dug out the Rodial and my skin has cleared up immediately. I was genuinely disappointed when I ran out of this lovely, light moisturiser. This is perfect for me as it's designed for those with breakout prone skin and humid climates. It's really expensive though and I am not sure I could justify repurchasing it immediately given the stash of moisturisers I have currently. You can read my full review of this great moisturiser here. Have been really impressed with everything I have tried from Elemental Herbology so far. What have I replaced it with? Caudalie Vinosource moisturising sorbet which is also lovely. I bought this on hype alone and have been using it as my evening eye cream since May. It's light and easily absorbed but can leave a bit of residue behind which is why I use it in the evenings-it seems to pill on the skin. Caroline Hirons describes this as 'every eye cream you ever bought, with added peptides'. Peptides are apparently an anti aging powerhouse but it can take 4-12 weeks to see the benefit of use. I'm not really sure I saw much benefit whilst using it to be honest. Firstly, why does this mascara vibrate? I never got that trend for vibrating mascara. Apparently it helps to 'massage' the nourishing formula into the lashes-crazy stuff! This is a white lash primer that you apply before mascara to improve the look of whatever mascara you apply on top of it. This formula promises longer and fuller lashes whilst conditioning them. This mascara has an enormously long, narrow plastic wand and I honestly didn't see much benefit from applying it which is disappointing given I was so impressed with the Mac Prep and Prime lash which I used prior to this. What have I replaced it with? Nothing at the moment as the Maybelline The Falsies is quite dramatic on its own but I know I have a Shisedo one in my stash. I reviewed this mascara here earlier in August and although I liked it as a good 'daytime' mascara the mascara was so dry, the tube dried up almost immediately. I may have had a dodgy tube but it was literally unusable after 3-4 weeks. I wouldn't recommend this because of that and because it definitely didn't deliver the thickened, false lash effect lashes it promises. I really liked this Jo Malone Red Roses-the boys in my office didn't! In fact they absolutely hated it. I could only smell the top note in it which was really clean and smelt like fresh roses but the boys said it had a more musky 'older' scent. Jo Malone categorise this as a 'light floral' scent and it has roses, lemon and violet notes so I am confused why the boys didn't like it! Would I repurchase? Probably not given the boys feedback! Love love love! I love the way this oil free primer smooths out your skin and seems to diffuse and even out your skintone before you apply your foundation. I know it's very silicon based which is why your skin feels like velvet after using it but I seem to be able to tolerate it. It's one of the best primers I have used and I will definitely be repurchasing! I used these sample sizes in the morning before my moisturiser. I quite like this light serum texture, it feels soothing and moisturising so makes a great base for under eye concealer. I don't think I used it long enough to say whether it was anti aging but Origins promise a 51% reduction in lines and wrinkles. Would I repurchase? Not now, maybe in a few years when I am more concerned about aging. 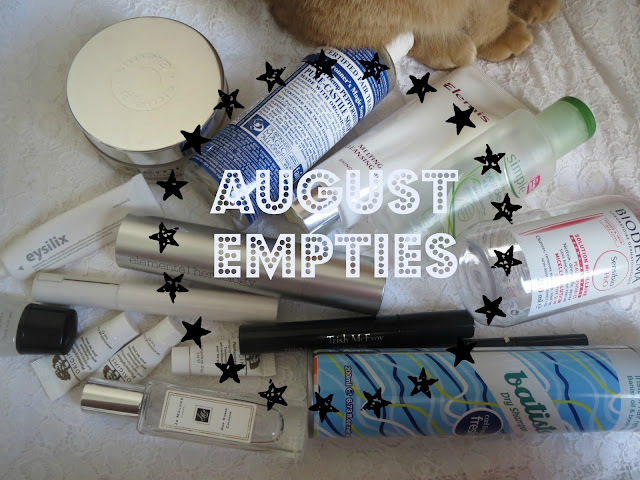 That's all my empties for August, well done if you've managed to get to the end of this post! I love reading empties posts so please me a link to yours in the comments!